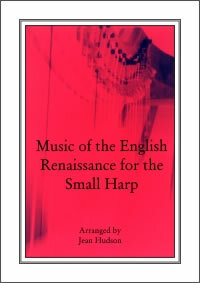 Music of the English Renaissance for the Small Harp. 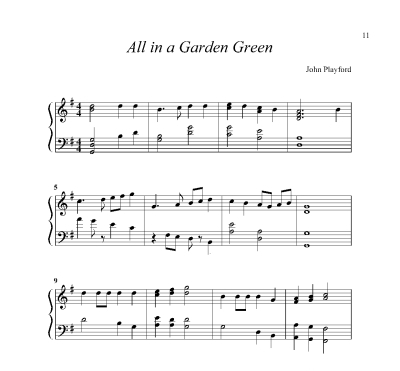 The music that I have selected for arrangement is best understood in the context of the society in which it was written. The pieces date from the late 16th Century to the early 17th Century. This period is generally refered to as the late Renaissance. Scholars regard the beginning of the Renaissance in Europe from the 14th Century when new ideas in the arts flowered and spread, finding their way via the courts into English society. The Court was the main point of contact with Renaissance ideas from abroad. It was the nerve centre of society, government and cultural life. Elizabeth I came to the throne in 1533 and was to continue her patronage to the arts as her father, Henry VIII, had done. During this time, the gentry were important in disseminating new ideas from the court to the provinces. The Queen herself was also instrumental in influencing the provinces. Not only did she support the best musicians in Court (the Royal Chapel being central to this) but it was also customary for the Queen to move from Great House to Great House during the summer months. This was known as the Queen's Summer progresses and it brought her directly in contact with the Great Houses, bringing with her the rituals and conducts of the court. The instrumental musicians were required to attend daily at court, particularly in the winter months and their primary duty was to provide music for dancing. Dance was an essential part of courtly life and Elizabeth is known to have been a keen dancer right into her later years. The dances of the time fell into two categories. There were the court dances, which came from abroad, such as the Bransle from France, whereas the Galliard, Pavan, Coranto and Volta are from Italy. The second group is the English Country Dances. The Earl of Worcester writes to the Earl of Salisbury in 1602 “We all frolic here at Court; much dancing in the Privy Chamber of country dances before the Queen's Majesty, who is exceedingly pleased therewith.” These dances seem to have been danced at the end of the evening, following the more formal court dances. The importance of dance as an essential part of Elizabethan society is well illustrated in Shakespeare's Twelfth Night: Sir Toby Belch asks Sir Andrew Aguecheck – 'Why dost thou go to church in a galliard and come home in a coranto?